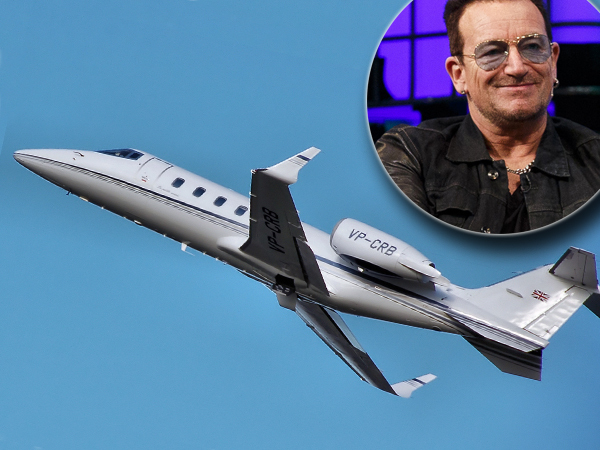 Bono is reportedly "extremely lucky" to be alive after a door of a plane he was travelling in fell off mid-air. The U2 rocker and his bandmates, The Edge, Adam Clayton and Larry Mullen, are due to be crowned the best international act at the Bambi Awards in Berlin today. Bono flew to the German city from Dublin earlier than the rest of the group because he had an event to go to. Yesterday he travelled in a Learjet 60 D-CGEO with four pals, who apparently didn't realise a bang they heard was part of the plane tumbling to the ground. "He was extremely lucky, the plane could have gone down. About an hour into the journey they heard a big thud coming from the rear of the plane. "They were startled for a bit but they continued on and made the descent into Berlin airport. When they landed they were horrified to learn that the compartment at the rear of the plane had completely detached," an insider told the Irish Daily Mail. Apparently the tailgate fell loose when the jet was 8,000 feet in the air. The luggage on board immediately fell from the plane and at the moment it's unknown exactly where it all landed. "They were at an altitude where anything could have happened and they are all feeling very lucky to be alive," the source said. The newspaper reports that German authorities have confirmed the plane was damaged when it touched down, and that the issues arose while it was in the air. Berlin Airport Authority's head of press, Ralf Kunkel, said discovering exactly what went on will be a job for the police. U2's representatives haven't commented on the report.